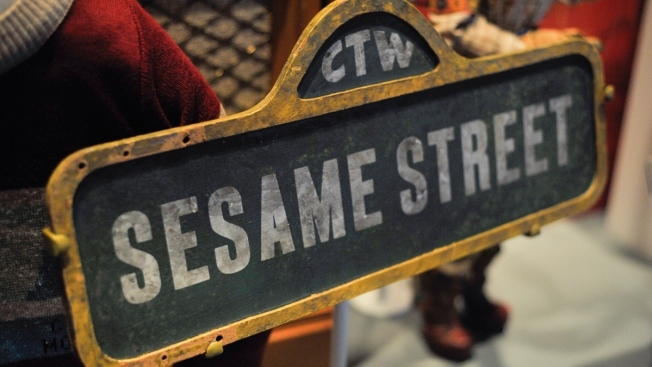 In this July 1, 2015, file photo, a "Sesame Street" sign from 1979 is on display during the grand opening of National Museum Of American History's Innovation Wing at the National Museum Of American History in Washington DC. "Sesame Street" is tackling yet another important issue with the help of one of their muppets: homelessness. Through recent "Sesame Street in Communities" videos shared online, "Sesame Street" introduced a new storyline for muppet Lily, who first joined the show nearly a decade ago. "I miss our apartment and now we don't have our own place to live," she says in one video as the rest of her schoolmates leave. "And sometimes I wonder if we'll ever have our own home again." As she tells her friend Elmo and Sofia in a separate clip, her family no longer has an apartment and she misses her bedroom as they stay in different places. After connecting "the dots of love" in one segment, Lily learns to think of home as where the love is. "Just remember all of the love that made this heart is the love that lives in [your] heart," Sofia tells her. "Whenever youre feeling worried or scared about home just think home is where the love lives." Instead of playing out on TV, Lily's story will be featured in online videos. Last year, the show introduced Julia, "Sesame Street's" first Muppet with autism. In 2016, Zari, a female Afghan Muppet, joined Baghch-e Simsim, Afghanistan's version of "Sesame Street."